The story of Superorganism's creation is one both well-documented and sorely overdue. See, thanks to the Internet, the concept of globalism is now anything but. Worldwide interconnectivity pits opposing gamers against one another, reconvenes two long-lost friends, and causes jokes in the form of memes to spread over continents like wildfire. 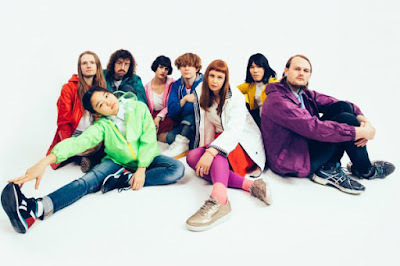 It's quite surprising then to note Superorganism as the first Internet-based band, composed of eight members that span cultures, lifestyles, and languages. At the helm, a 17-year old Japanese girl from Maine. Her presence, one that's reclusive and modest, counteracts the ADD-inflicted Glitch Pop with monotone singing, offbeat humor, and a crude but pragmatic outlook on life, giving Superorganism their salient style. This runs the gamut in the group's debut album, one that springs to life with summertime Pop, but suffers from a lack of branching ideas and general tomfoolery that exploits, and panders to, callow quirkiness. Unlike most who first heard of Superorganism through 'Something For Your M.I.N.D.' on Frank Ocean's Blonded radio or in the FIFA 18 soundtrack, my first exposure to the band fell on the spastic overkill of 'Everybody Wants To Be Famous'' memeified music video. It was, and still is, the perfect representation of the group. From Orono's comment box searching quest for fame, to the band's synth-ridden Psychedelic Pop that relies on commonly depleted tropes, to their all-consuming aesthetic that bombards vibrancy with an eager seizure warning label attached. This can be seen everywhere on Superorganism's ten cuts that amount to a brisk 34 minutes. Within the first 30 seconds of opener 'It's All Good,' a solid ten sounds are form-fitted into each other, including a vocal sample of a robotic alarm clock. Around Orono's unwavering vocal pitch alone we hear bird chirps, screams, empty breaths, even cleaning products being squirted. This isn't an extremity, it's a norm. 'Everybody Wants To Be Famous' has cash registers and photograph flashes, 'Nai's March' has applause and frog ribbits, 'Night Time' has busy traffic and 8-bit death synths. This goes without mentioning the endless schizophrenia of unintelligible sound effects. Superorganism is an album for a new era of consumption, one reliant on the Internet's omniscient factoid dump. However, glazed over all the nonsense is a teenager whose no-nonsense songwriting aims to take precedent. Curiously enough, despite Superorganism's clear obsession over the 'le random' community, Orono often provides an antithesis that reels reality back in. Opener 'It's All Good' (and 'Relax') finds the singer taking solace in life's simple pleasures despite the possibility of building stress, 'Nobody Cares' mocks those who hold their self-worth over that of others, and 'Everybody Wants To Be Famous' analyzes the vanity of our youth's misguided attempts at stardom. Orono's fragile appearance defiantly counteracts that of her staunch, and potentially pompous beliefs. For Superorganism, this contrariness works as a pro. Her vocals however, do not. At least not for the duration of the album, considering the dry invariability runs cold once the reputable singles run out (at track six). Apart from closer 'Night Time,' which paces itself through some smart mid-tempo Synthpop, this stretch of deep cuts lack that identifiable polish and novelty, as we see on 'Something For Your M.I.N.D. 's' unmistakably catchy chorus or 'Everybody Wants To Be Famous'' marvelous bridge and final hook. 'Nai's March' entices with a mood shift, only to revert - through a beat switch of Nintendo samples - to aimless synth farts, whereas 'Relax' takes Superorganism's meme obsession to irritating heights, with a nauseating amount of sound diversions. By this time, Orono's presence starts to turn to a lack thereof, with the singer presenting no alternative mindset than the one her character is built on. Despite the high chance for a surly response from bitter folk not amused by Superorganism's premise, creation, and motto (myself, at times, included), there's no denying the inescapable urge to dance, sing, and shake along to the band's first carefree memento.